In case you haven’t figured it out, I’m a writer. Which means words to me are like clothes to a fashionista, books to a librarian, bacon to pups, and a slime trail to a snail. Throughout my life, they help me get my point across during conversational gambits, much like painting a auditory picture so you get the full Dolby experience. You get the picture. I also happen to be a mom to two teen boys–one sliding into sixteen, the other turning into the last curve of 17 before he hits 18. Therefore, I have a responsibility to prepare them for the looming adventure, known as “Adulting”. I’ve done my job well since they both dread and crave this new life stage. Biased or not, I think it’s safe to share that my boys are swift on the uptake, quick on the zinger type comebacks, and more than up to wielding their super powers of sarcasm. (Yes, I do mark that in the win column.) Our family discussions can range from the current mud puddle of the political landscape, hairy and highly awkward social situations (for them and their friends), every day family challenges (“We don’t want to set your expectations too high, so we only clean the bathroom when you’ve unplugged the computers and hidden the power cords.”), analysis of the latest dust ups in whatever multi-player game they and their dad are involved in, in-depth movie/album reviews, and the list goes on. Have to admit that for me, this is my favorite time with them. Mainly because I can get into deep discussions, silly conversations, and shoot the breeze with both of them. Watching them morph into the adults I can see hovering on the horizon is freakin’ cool. And because I want them to be their own people, recently I have backed away from the strongly held line that’s existed in our house since they could first form words–swearing. And not just when you’re upset. Oh no, we know how to use descriptors for a variety of reasons: excitement, to make a point, and yes, to get across a high level of frustration. 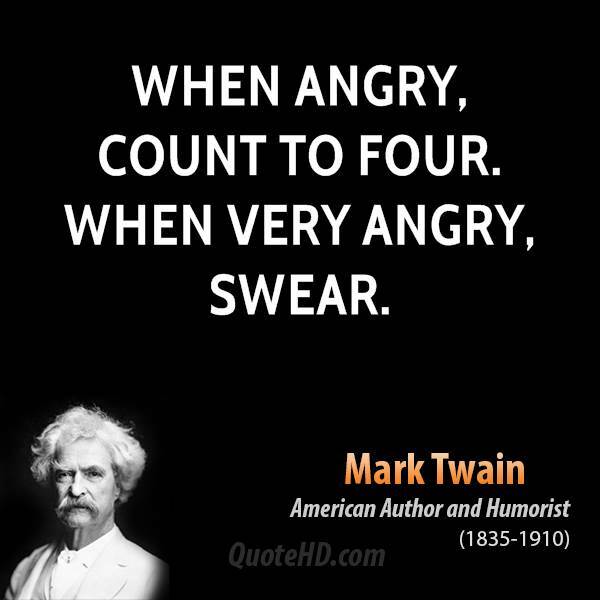 In fact, we consider swearing a creative endeavor. Up until about a year ago, even though the Knight and I judiciously enhance our descriptive dialogue with colorful phrases, we were quick to nip they boys’ mimicry in the bud. It wasn’t because I got tired of doing it, but because I made the choice that if I use that language, I don’t have a leg, much less a foot, to stand on when I demand differently from them. That whole “Do what I say, not what I do” just doesn’t work in our family, because it’s not how we roll. I know many parents keep a tight rein on how their kids express themselves, and since it’s their family, their kids, and they know what best works in their family unit, I have nothing but respect for them. Plus, I get it. I was raised with the knowledge there was a certain expectation of how you conduct yourself in public. That same expectation was passed to our boys, but in the privacy of immediate family, you be you. If you’re passionate about a topic, go with it and tell me what you feel, even if you have to add a few colorful descriptors into the mix to get your point across. The Knight and I have encourage this kind of blunt, honest communication for a variety of reasons, and I won’t share them all because, well, that’s ours, but I will share one of the main factors behind our decision. Those who’ve followed me or read some of my interviews, you know that I moved into a new family at 12 and was adopted at 14. Before that, I lived in a family where honest expression was discouraged and secrets were the name of the game. I knew when I had my own family, there would be no secrets, no buried feelings, no festering resentments, no sense of shame of feeling whatever it was you felt as you experienced it, because we are human and should be allowed to be true to who we are and what we’re feeling. Besides, if it’s not safe for you to be you with those you love, something is wrong. I wanted my boys to feel safe with their dad and I. So yeah, to an outsider, I may seem like a lax parent, but time has proven over and over, that I’ve been lucky enough (with my Knight’s help) to create a safe haven where my boys don’t fear sharing who they are with those they love. If that means the vocabulary choices of my boys is a bit questionable, so be it. So yes, I get it, allowing your children to swear is highly frowned upon. Except I’d rather deal with creative language choices than be worried that they’ll hide what they’re really dealing with behind their proper use of the English language. Parenting is a rocky ride through a wild rose garden filled with hidden gopher holes and nasty pesticides, so do what you know will get you the hardiest, most stunning blooms you can. Those blooms are what the world will stare in amazement at, and when they go to pick it, they’ll find those roses’ roots are anchored solidly in an endless depth of love and safety, which means no one gets to pluck them out. Posted in Life and tagged family, language, teens. Parenting is never easy. Thanks for giving a glimpse into your life with teens. Your duo is wonderful, so keep up the good work.